"Garr is described as one of the lieutenants of Ragnaros who carried out the betrayal of Lord Thunderaan, the Prince of Air and otherwise referred to as the "Windseeker." During the Elemental Sundering, Ragnaros sought to consume Thunderaan, and did so by having his two lieutenants, Baron Geddon and Garr perpetrate him. Thunderaan, caught off guard, was utterly destroyed. Ragnaros almost completely consumed Thunderaan's essence, and stored the rest within a talisman of elemental binding. Ragnaros cleaved this talisman into two equal pieces, to which he assigned Baron Geddon and Garr. The bindings are rare drops, both of which gathered can be used to forge Thunderfury, Blessed Blade of the Windseeker." Yesterday, with 5 other friends, i came back MC as a Tankadin for the legendary weapon Thunderfury, Blessed Blade of the Windseeker. After killing some mobs we faced Garr. The mobs are very easily for us now, but everyone should take care the 18min respawn of Ancient Core Hound. Note that Garr is 3 levels upon us but the Firesworns are still 60 elite. Our strategy is as below. I aggro and pick up 8 Firesworns. Meanwhile, one hunter misdirect Garr to our warrior tank. DPS focus on Garr first. And one healer is enough for the two tanks. Here is experience of tanking Firesworns. NO banish is need until Garr is dead. Because they could hardly hit me, a T5 geared tankadin. There're always Miss/Dodge/Parry/Block scrolling. The most hurt comes from their Immolate. However, as a paladin, i could Clease the DoT on sight. The Firesworns will become enraged after Garr's death and hit me about 800 after block of 600+ value. So at this time, the healer turn to me, and warrior tank taunt one away from me, and warlock banish one. Then fire at will and kill them all. I soloed this boss (3rd of september 2008) as a prot warrior with 92% passive unbuffed uncrushability and with roughly 670+ shield block value, this can be done in pre 25 man gear (karazhan ZA) - avoidance stats and Defense gemming is the key, gem Parry/dodge gems if u get an avoidance socketbonus, if not go for the Defense gems. No need to think about stamina/health since with 100% avoidance u wont be hit ever (or very little if u dont have enough Block value to block whole melee attacks). The only thing that could hurt u is the Elemental Adds self-explode ability. - You can kill all of the adds one by one and then the boss last. This might seem obvious, but back in the early days of Molten Core, alot of people were convinced that if you did this (and didn't save at least 1 add from death) that Garr would either enrage or begin summoning Magmakin to wipe the group. Whether or not that was ever the case, it isn't now. All the adds can safely die before Garr. - The adds explode on death, which can knock back everyone nearby. This is mostly resisted at level 80, but just to be safe, don't kill them near your healer. Unbreakable Armor will be changed and the cooldown will be increased to 2 minutes. Lichborne is pretty much becoming a PvP-sided talent. The 25% miss chance is being removed in the patch. I forgot to open my raid pannel, but my first picture shows me fighting Garr around 36% with an offline lvl 6 hunter in my raid party. Perfectly soloable by any decent geared protection warrior at level 80. Make sure all the adds aswell as Garr are in front of you. Keep up demoralizing shout aswell as thunderclap and focus your attention on Garr and do as high DPS as you can. Every time you reach 70% hp (should not happen more than twice in the fight) you use enraged regeneration. And voilá, soloed. Full furious retribution paladin: solo'd without any special tactics. Even aggro'd a corehound on accident. Keep sacred shield up, the dispell is really slow and is likely to hit something else anyway. Hardest part of the fight was when I panic'd from the damage at the start. Then I realized my divine storm was healing me for 10k and all was good. pull him back, hit him hard, run from his hellfire, bomb should be on you soon. Heal to full with instant FoL and hit him hard again. Make sure SS is up, save your instant heal ... explode, heal and hit him hard again while in the air, use instant heal again after landing. Drop Consecration and run from him if he's casting hellfire. The fight is pretty easy and won't take long. Go prot, keep FR aura, SoL/JoL and SS up. Hit him hard while you can, mana/hp won't be a problem. At 20 stacks of armor debuff, switch to one of his dogs, get back all your mana, wait till the debuff wears off and go back to Gol. Rinse and repeat. Pull with an imp, run and teleport through the tunnel heading to Geddon, fast-summon your tank-pet, send it on Garr, jump into the lava and start healing your pet. The Adds will evade and Garr can be killed off easily. For some strange reason, Garr sometimes teleports you to himself during the pull which will end things very fast for you, so don't rely on this tactic too much. Pull Garr with a Voidwalker, activate Metamorphosis, chain-seed adds, use every cd you have to stay alive (including VV shield) and bomb them all within several seconds (don't forget Immolation Aura as well to finish them off). Definitely the most spectacular way to beat him. Originally fought this guy as a 80 frost mage with mostly ilevel 264/277 gear. Garr and his rock babies... Mages this is a fight where your Water Elemental will shine as a tank (make sure you have rank 3 of Permafrost to heal him best). This fight is not a tough one thankfully. This boss is all about the adds once you kill them Garr is easy. Garr will dispel any raid buffs (Fort, Wild, Kings, or Int) or magical shields (i.e. Ice Barrier) you have very frequently if in 45 yards of him. No flasks or food buffs will be dispelled, kings drums will be though so don't waste em. It's not too terrible but can be annoying. If this bothers you just make you have your elem tank him way in the back by the wall while you pull the adds away to the front (kill the packs around the room for this). However, it's not gonna be a game changer. If you get hit by it, it 1 shots you and blows you away. I got Garr's Bindings in 4 runs,and no Geddon's Bindings in 9 runs. Next week,i hope i get Geddon's Bindings and Eye of Sulfuras for two Feats of Strength. 1. be sure that you have Demon Armor activated, cause it can be really hard with Fel Armor. 2. Attack Firesworn with Haunt. 3. After that send your Voidwalker to Garr and use Curse of Weakness on boss. 4. Use Haunt on Fireworns whenever you can, spam with Drain Life to kill them and use Life Tap when it's needed. 6. After killing Firesworns use Haunt on Garr, then put all DoTs, keep them active and keep using Drain Life and Life Tap. Edit: Stop downrating! I don't see what's to downrate, I mean, seriously, tell me what there is to dislike. This is meant to be funny. Retards. 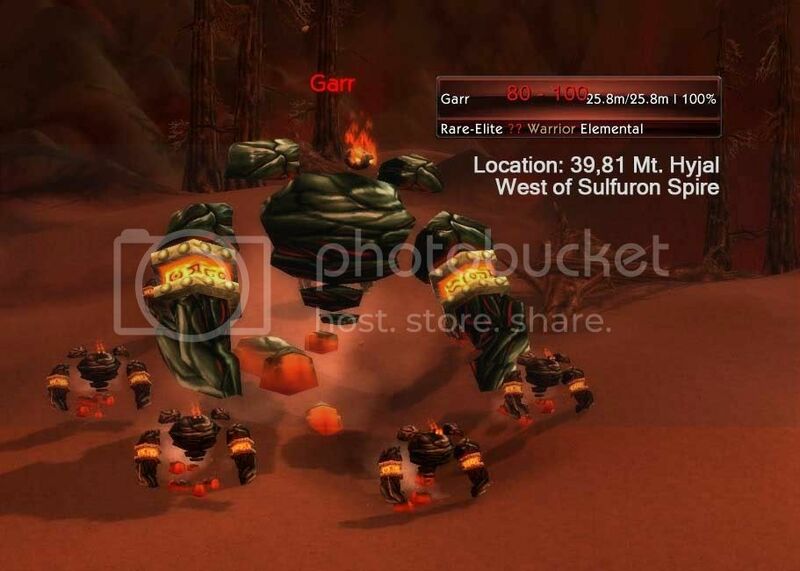 Garr, a large obsidian elemental, is the fourth boss of Molten Core. He is joined by eight Firesworn. Garr drops Bindings of the Windseeker, one of two pieces needed to create Thunderfury, Blessed Blade of the Windseeker. Once Garr is defeated Lava Surgers will no longer respawn in the instance.